The Reconcile: Checking window is basically just two lists: one of account withdrawals and one of account deposits. The window also displays some extra information at the bottom: the Cleared Balance (which is your account balance including only those transactions that you or Quicken have marked as cleared), the Statement Ending balance, and the Difference between these two figures. Just leaf through the bank statement and find the first deposit listed. Scroll through the transactions listed in the right column of the Reconcile: Checking window, find the deposit, and then mark it as cleared by clicking it. 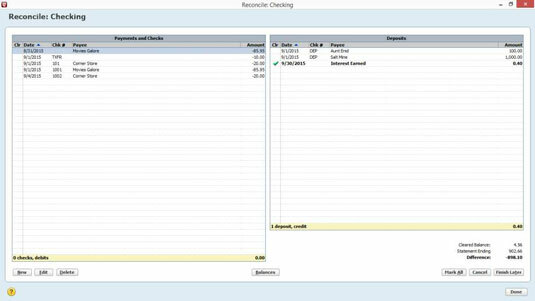 Quicken places a check mark in front of the deposit and updates the cleared statement balance. If you can’t find a deposit, you haven’t entered it in the Quicken register yet. Return to the Quicken register by clicking the Edit button and then enter the deposit in the register in the usual way — but type c (for cleared) in the Clr column. This mark identifies the deposit as one that’s already cleared at the bank. To return to the Reconcile: Checking window, click the Return to Reconcile button. Identify the first check or other withdrawal that has cleared. No sweat, right? Just find the first check or withdrawal listed on the bank statement. Mark the first cleared check or other withdrawal as cleared. Scroll through the transactions listed in the left column of the Reconcile: Checking window, find the first check, and select it to mark it as having cleared the bank. 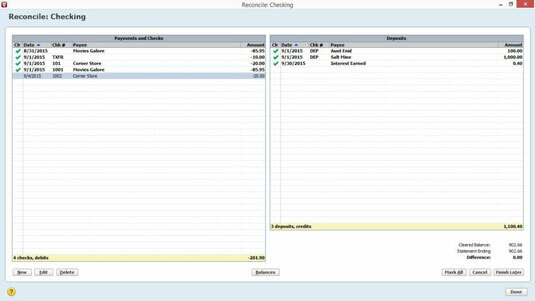 Quicken inserts a check mark to label this transaction as cleared and updates the Cleared Balance. Record any missing but cleared checks or withdrawals. If you can’t find a check or withdrawal — guess what? — you haven’t entered it in the Quicken register yet. Display the Quicken register by clicking the Edit button. Then enter the check or withdrawal in the register. Be sure to type c (for cleared) in the Clr column to identify this check or withdrawal as one that’s already cleared the bank. To return to the Reconcile: Checking window, click the Return to Reconcile button. Repeat Steps 5–7 for withdrawals listed on the bank statement. After you mark all the cleared checks and deposits, the difference between the cleared balance for the account and the bank statement’s ending balance should equal zero. The figure shows a Reconcile: Checking window in which everything is hunky-dory, and life is grand. If the difference does equal zero, you’re done. Just click the Done button to tell Quicken that you’re done. Quicken displays a congratulatory message telling you how proud it is of you; then it asks whether you want to print a Reconciliation report. If the difference doesn’t equal zero, you have a problem. If you click Done, Quicken displays a message box that provides some cursory explanations as to why your account doesn’t balance. 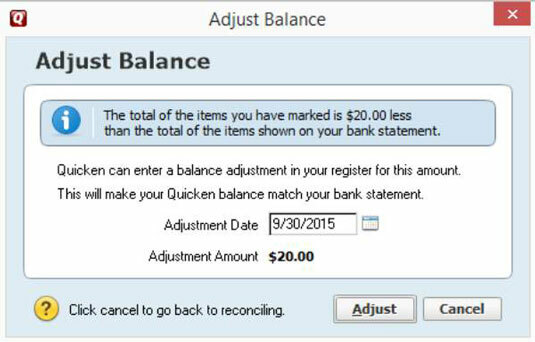 Then, if you indicate that you want to soldier on anyway, Quicken displays the Adjust Balance dialog box. This dialog box tells you, in effect, that you can force the two amounts to agree by clicking the Adjust button. If you can’t get your account to reconcile but want to save your work, click the Finish Later button. Quicken leaves your reconciliation work basically half done. The transactions that you marked as cleared still show c in the Clr field, and you still have an unexplainable difference between the bank statement and your register.